Folic acid is one of those vitamins that can do wonders for pregnant women and their infants—but some women just aren't getting enough of it. Here's why. Folic acid is one of those nutritional powerhouses that pregnant women should load up on to help prevent birth defects, and the good news is, you can find the vitamin in some of your favorite foods. The FDA pushed for this vitamin to be added to things like cereal, breads, pasta and rice back in 1998, which means you have one healthy incentive to indulge those carb cravings. In fact, the mandatory addition of folic acid may very well be the thing that's caused the rate of neural tube defects to drop by about 35 percent from the 90s, according to NPR. But not everyone is so positively affected by that mandate. 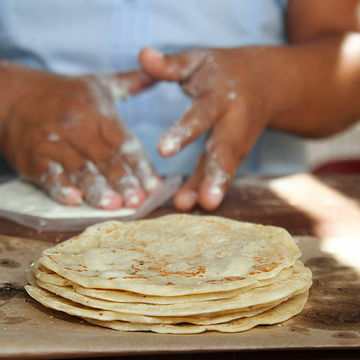 Hispanic women aren't seeing the same high success rates associated with folic acid consumption and one theory suggests that it might be because one common food item wasn't affected by that 1998 rule change: Tortillas. Tortillas, corn chips and similar food items can't be fortified with folic acid under current FDA rules. This might explain why rates of neural tube defects are highest among Hispanics, with a roughly 20 percent rate of defects. The reason behind the ban on folic acid in tortilla products has to do with nixtamalization, which refers to the process of softening corn kernels in alkaline solution. The FDA worries that this process could affect the stability of the folic acid, yielding questionable substances. Diet is likely not the only factor in higher rates of nueral defects in this demographic—researchers have pointed to genetic predisposition as a possible cause, but it seems the lack of folic acid in diets plays a role as well. Cynthia Pellegrini, senior vice president of public policy and government affairs at the March of Dimes says this demographic simply doesn't consume high amounts of wheat flour products. There are specifics to consider when talking about how folic acid can help during pregnancy. For one thing, it must be consumed during the first few weeks of pregnancy in order to work its magic, which means pregnant women sometimes don't realize they're pregnant until it's too late to make this change. Folic acid can prevent spina bifida (which can cause paralysis) so the importance of it shouldn't be taken lightly. The March of Dimes is petitioning the FDA to rethink policies about folic acid in these food items—stay tuned for the results.